We may be living in a post-truth era anyway, but the fake news frolics of April Fool’s Day continue to induce groans, titters and the occasional guffaw. We've heard a lot of piffle talked about 'the cassette revival' over the past few years, but surely only the greenest of hipsters will have swallowed Korg's April Fool's Day scam. 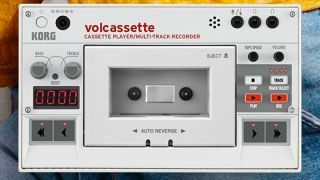 Said to combine "the very best of portable cassette players with super-intuitive four-track true-analog recording capabilities," it's the product that only Nine Inch Nails’ Alessandro Cortini will be interested in. One of the better - spoiler alert - Photoshop efforts we’ve seen this year, LeftyFretz’ Fender American Professional Ambicaster purports to be the first ambidextrous electric guitar. That means it’s got both left- and right-handed configurations in one instrument, although we’d argue they’re just a little close together to be practical. Imagine trying not to hit that selector switch while playing! Nightmare. Software emulations of preamps and poweramps now sound pretty convincing, but for genuine authenticity, you need tubes that might break and need replacing. Step forward Mercuriall Audio with its Living Tubes - digital tubes that will age like real ones. Fortunately, tubes are guaranteed for a year; if they go wrong after that you can choose replacements of varying quality at different prices. In a move that recalls John Cleese’s woeful ‘adaptive camouflage’ Aston Martin in staggeringly implausible Bond flick Die Another Day, Marshall revealed the Invisi-series of - you guessed it - invisible amps. Ironically, Marshall cabs are such a status symbol that big-name artists will sometimes stack the stage with 4x12s that don’t contain any speakers at all. Ableton has a new instrument for recorder players who are struggling to find a place in a polyphonic world. We'll award extra marks for the super-earnest promo video, which nicely lampoons the 'this is a gamechanger' tone of so many real clips. Line 6 can always be relied upon to deliver a top-notch gag come this time of year, and a "tone sack" designed to stow the company's best-selling HX Stomp certainly fits the bill. "Conquer your next gig by using the world’s finest tone sack, designed to cart the crown jewel of your rig with both steadiness and star power. Turn the rest of the band into a walking wardrobe malfunction and show them all up with HX Rump!" Sonarworks announced its first hardware product, bringing its acclaimed Reference tech to a guitar pedal format, aiming to “remove the guesswork from guitar setup via the transformative power of DSP”. The company’s new Augmented Feedback technology is behind the release, utilising the guitar’s pickups as microphones to dynamically calibrate the amp for the guitarist’s current position. This one kind of reminds us of BBE’s Sonic Stomp, but better - and fictional. Sick of having to put up with in-ear monitors that don’t fit? Dip the Magic-Grow AudioFoam IEMs in water before you head on stage, stick them in your ears and they’ll expand to fill your lugs perfectly. Plug in the supplied cable and you’ll get “reference-quality sound, every time”. If Gibson hadn’t had such a storming return to form at this year’s NAMM, we might have been fooled by this one for a second or two. This effort from GuitarGuitar is let down somewhat by the fact that the guitarist in the shoot is playing a Strat, and the box is bloody enormous, which is not at all in keeping with the Swedish style merchant’s logistically sound packaging dimensions. We’ll come clean: we actually got quite excited about this while absent-mindedly scrolling through our Facebook feed… until we remembered the date. A foot-operated theramin, the Footheramin features two metal antenna: one to detect the position of the foot and control oscillators and frequency adjustment; the other to adjust volume. We’re particular fans of the war/wee/woo/wah toggle-switch. In a nod to Gibson’s much-maligned - and never actually released - Jimi Hendrix signature models, Eastwood announced an ostentatious new Airline, the 66 2P ‘Purple Haze’. A lengthy backstory proclaims that the guitar is based on the model played by Jimi during his ’66 residency in Greenwich Village, New York. Inspired by blues guitarist JB Hutto, the story goes that Hendrix picked up an Airline for two weeks in June 1966, dubbing it “a piece of plastic crap” and switching to a Fender Stratocaster soon after. Kicking off with a slightly dated reference to a new Guitar Hero degree, ACM announced a host of new courses and events, including Rubber Hands to instantly improve guitar ability and the ability to regenerate Freddie Mercury. The Songerly songwriting app, which offers feedback on your compositions, could be an actual winner, though. It’s not dissimilar to the kind of pre-production courses offered by big-name producers like Michael Beinhorn, although ACM do point out that the service is brutally honest, and if necessary, will “advise you to scrap the entire mess and start again”.